Uruguay captain Diego Lugano is of the opinion that embattled teammate, Luis Suarez's four-month ban is not fair and has described it as an act of 'barbarity' that breaches the player's human rights. World football governing body, FIFA suspended Suarez from all football-related activity until the end of October after he bit Giorgio Chiellini during Uruguay's final group game on Tuesday. So the Liverpool striker was sent home and wasn't available for Saturday's second-round match against Colombia and Uruguay suffered without him, falling to a 2-0 defeat thanks to a brace from James Rodriguez. 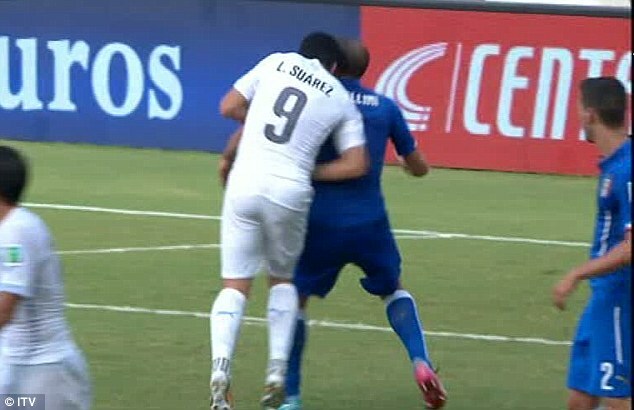 After the match, Lugano lashed out at FIFA for imposing the record ban on Suarez. 'It's a breach of human rights that a player cannot go into a stadium where there are 80,000 people or into a hotel with his team-mates, that he cannot work for four months,' the defender said. 'He has committed a crime, but this (ban) is barbarity. Thirty five year old Diego Forlan played poorly and Edinson Cavani did not have the same impact as he did against England when he played alongside Suarez. 'He is irreplaceable,' the former West Brom defender said of Suarez. 'Against Colombia we weren't able to replace the skills he has. 'For years he has been our best player. Cavani insisted the Suarez saga had not proved to be too much of a distraction in the build up to the game, though. 'From the moment we knew about the sanction, we only thought about Colombia,' the Paris St Germain striker said. Meanwhie, Diego Forlan, said Colombia deserved to go through to their quarter-final match against Brazil. 'The are a good team with good players,' he said.